4 Bedrooms,large private pool,Great fishing!!! This is one of the best vacation spots in the area. It's an immaculate 4 bed/3 bath two Story on 3rd St. Sleeps 8-10 (King, King, Queen, 2 Twins and sleeper sofa) .All bedrooms have flat screen TVs. The living area is tremendously spacious. It comes with a Cabana Club Membership which allows you access to a private beach and pool (Great for kids). It has a great dock with a fish cleaning station. You can fish right in the back of the property or hop on your boat and cruise to plenty of fishing hot spots. Central A/C, washer/dryer, hi speed internet service, dishwasher. Private pool. (heat is additional).also includes 4 bicycles. Interconnecting door to other half of duplex, so this unit and the other half of the house can be rented together - if desired. together you could have 8 bedrooms.Perfect for family reunions. Enjoy the Cabana Club membership that is just 2 blocks away!! The house was perfect for our Family Vacation! It was really nice to have our own pool and boat dock. The location was excellent and the pass to the Cabana Club was a very nice bonus with a private beach. Everything was great!! 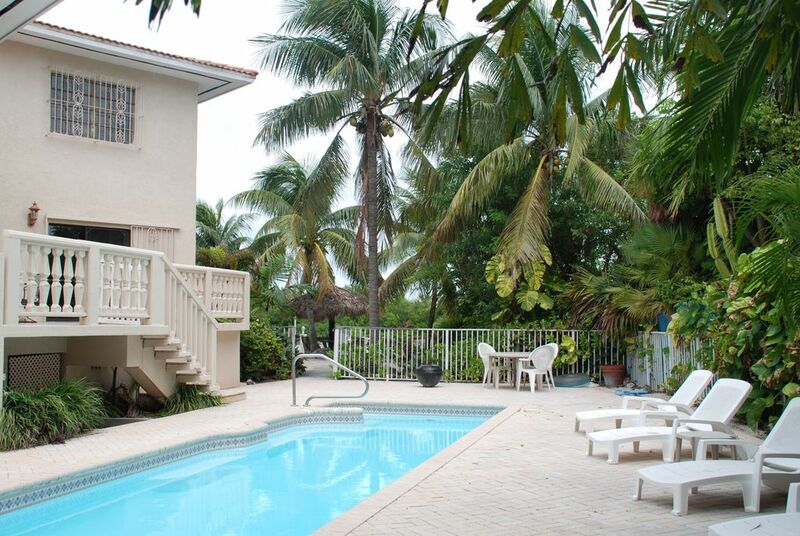 We rented both sides of this property for a large group of families (adults and children ages 7-13). The location and views are perfect. Very close to the ocean; we saw lots of fish, stingrays, and nurse sharks from the dock and kayak. The house is very large and accommodated our group of 17 easily. The house is showing some wear, but it was clean and we had everything we needed for our stay. Will definitely be back. Home is very large and perfect for a larger damily. Had a few issues with the pool, but they addressed them quickly. Overall we really liked the place and would come back again. The house was perfect! There was plenty of room for all my entire group of 7 adults and 3 children. We really enjoyed the pool and fishing from the dock. The house is conveniently located to a number of restaurants in the area and down a quiet street without any interruptions. We will definitely look to stay here again and probably rent out both sides for a larger group! Toni was wonderful working with us on such short notice and was able to accommodate our family. Anytime we came across across a snag Toni was extremely responsive and attentive. We would definitely love to come back again!! This is our favorite place to stay !!!!!!! !